The Network of Aquaculture Centres in Asia (NACA) is a coordinated and interlinked system of Asian fish culture institutions working in close cooperation on the development of technologies, personnel and information needed for achieving fish production increases through aquaculture in the Asia-Pacific Region. Collaboration among countries within the region has been recognised as an effective way of accelerating aquaculture development, while the approach of sharing responsibilities in research, training and information dissemination would optimise the use of existing capabilities and facilities and minimize duplication of costly efforts. Aquaculture technologies have been in existence for many years in Asia but these are mostly based on traditional and artisanal practices. Although institutional research inputs have been provided in attempts to increase yield, these are mainly directed at specific disciplines and not at a culture system as a whole. 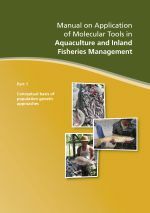 Besides duplication of research resources, specific technologies developed under different sets of conditions may not necessarily make a culture system a complete entity needed for implementing aquaculture extension and development programmes. Knowledge gaps still exist. It has been recommended that these gaps be filled through multidisciplinary and system-oriented research. This new approach in developing a culture system breaks away from the classical but more time-consuming and costly types of research in which specific technology within a system is developed disciplinarily and independently. For these reasons, one of the objectives of NACA is aimed at developing aquaculture technology through system - and production-oriented, multidisciplinary research for adaptation and extension. While attention is given to adaptive research to achieve immediate impact, applied and even basic research may be conducted if a selected system so demands. RLCC (China): Integrated fish-livestock-crop farming. RLCP (Philippines): Shrimp and brackishwater finfish culture. Pond culture of airbreathing catfish (Clarias batrachus) and snakehead (Channa striatus). Pond culture of giant freshwater prawn (Macrobrachium rosenbergii). Pond culture of Puntius gonionotus. Cage culture of river catfish (Pangasius sutchi). Rice field culture of Sepak Sian (Trichogaster pectoralis). Culture of mussels (Perna viridis) and oysters (Crassostrea spp). 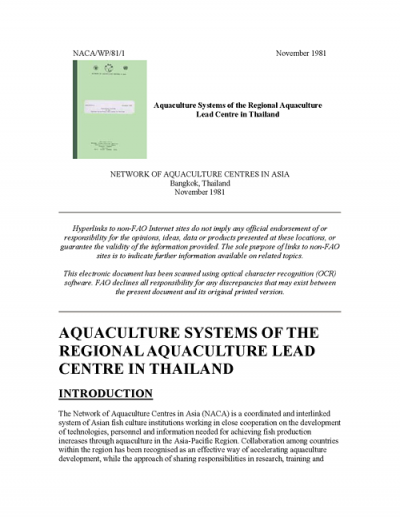 For the purpose of this working paper, the status of the aquaculture systems of the Regional Aquaculture Lead Centre in Thailand is briefly described.